The Daily Rant: Nailed It! Today is the birthday of my oldest nephew and my dear friend Marlaina. My nephew went out of town for his special day and Marlaina was staying with us, so our plans for a dual celebration were off and I became responsible for the cake. 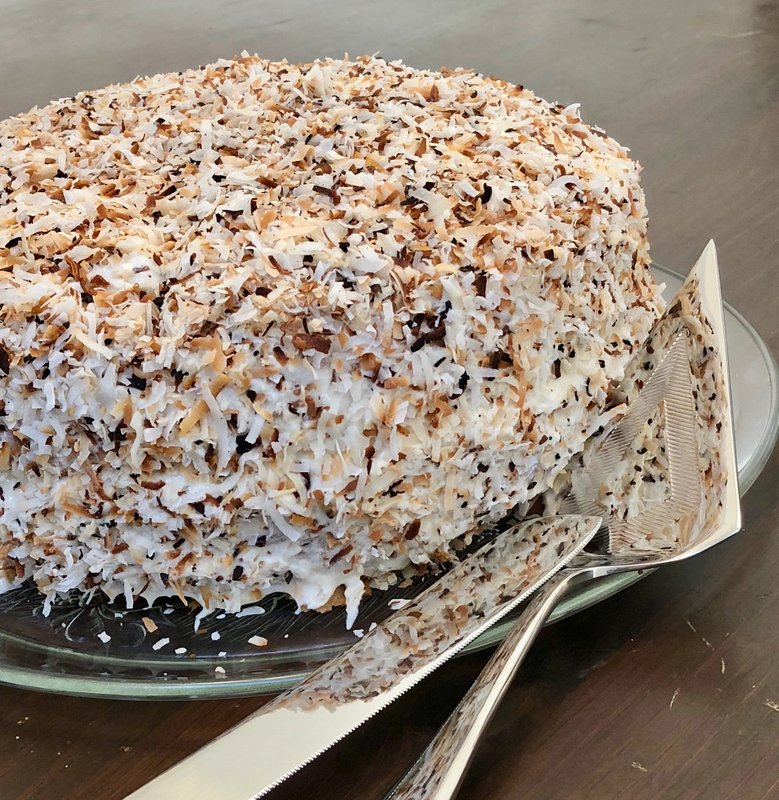 Marlaina requested Coconut Cake with Coconut Buttercream Frosting and Toasted Coconut on the outside. I researched recipes and decided not to go completely from scratch. I was going to modify a boxed cake mix. So I bought a Duncan Hines Classic White Cake Mix for the foundation of the cake. Instead of the one cup of water the recipe calls for, I used one cup of Coconut Cream in its place. I made two 9" rounds (1 box for each cake) and after they were done, set them on cooling racks before I frosted them. The frosting seemed thinner than I wanted, and it wasn't until after I'd frosted the cake that we Googled "thin buttercream frosting" and found out that several people had the same problem. Some suggestions were to add cream cheese, some said add cornstarch, some suggested heavy cream. If you're intending on using it like an icing and pouring it over the cake, I think a thinner consistency would be fine. I wanted a thicker frosting so I would have something for the toasted coconut to stick to. Toasting coconut is easy. I used one 14 oz. bag of Baker's angel flaked sweetened coconut and one 7 oz. bag of flaked unsweetened coconut. I mixed them together, spread them out on two sheet pans and put them in the oven for 5-10 minutes at 325 degrees. You have to watch it because the coconut burns quickly if you leave it unattended. I had one sheet pan that was golden brown and one that got a little darker, but I don't mind the darker pieces. Once it cools, the coconut is crunchy and delicious. I mixed them together and they wound up looking beautiful on the cake. I had tons left over, but I use the coconut in other things, too - like my morning yogurt - so I love having it on hand. I assembled the cake with a layer of frosting and toasted coconut in the middle, frosted the outside and then sprinkled the toasted coconut all over it. The cake was a HUGE hit! It was insanely moist and was bursting with coconut flavor! The birthday girl was thrilled. I hit it out of the park with this one. Huge success!! Happy Birthday, Marlaina!! And Happy Birthday, Nic - wherever you may be today - come by for some leftover cake!